One of the best ways to take good care of your hair is by using shampoo once or twice in a week to clean your hair. Not only does it remove all the dirt in your hair, but it also nourishes and improves the health of your hair. However, did you know there is a way you can enhance your shampoo experience? 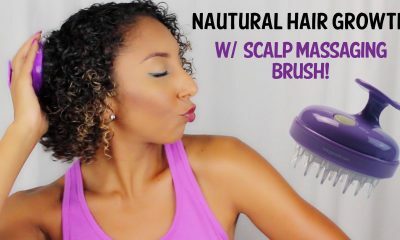 You can do so by incorporating a scalp massage brush while shampooing your hair. A scalp massage brush can provide you with a stimulating and relaxing experience that helps to relieve you from mental fatigue and stress effectively. The origin of the head massage brush can be traced back 5000 years ago in India where it was a part of an Ayurveda holistic medicine. The massager works by stimulating the nerves and blood vessels that are beneath the skin hence improving the circulation of blood and releasing the tension of muscles. Once the nerve endings of the scalp are stimulated, they lead to an increase in secretion of dopamine levels that provide a euphoric feeling of satisfaction and pleasure. Additionally, as a result of using the scalp massager, there is a production of serotonin and endorphins that lead to a reduction in fatigue, depression and an improved mood. There are different types of head massagers in the market. 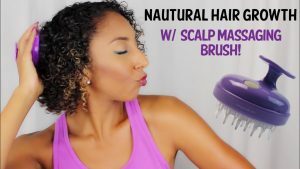 After intensive research, we have identified the top scalp massager brushes that can help ensure you have healthy hair growth. The Top Scalp Massagers for Hair Growth. 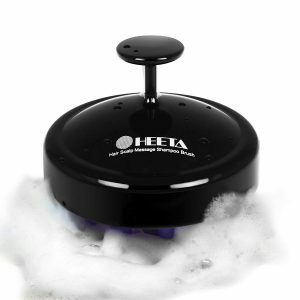 The Heeta Hair & Scalp Massager is a manual shampoo brush that does not require the use of batteries. You can use the brush in the place of a regular comb on any hair type regardless of whether the hair is wet or dry. The brush is as well a good option if you want to get one to use on your pooch. The Heeta Hair Scalp Massager is lightweight and has an ergonomic design that allows it to fit in your palms perfectly. It allows you to have a firmer grip on the brush while at the same time offering protection to your nails helping you not damage them when in the shower. The head of the brush is made of high-quality soft silicone bristles so that it does not harm the hair. Even so, the silicone bristles can get through thick hair making the brush a suitable option for people with thick hair or those that need to use more robust hair bristles. The LIBA Scalp Massager Tool is also known as a spider massager due to its look. It has spindles with rubber beads at the ends that connect to the head. Each spindle glides over the head giving you a euphoric feeling that melts away your stress leaving only a sense of calmness. The LIBA Scalp Massager Tool is ridiculously good, relaxing and addictive. By using it just once you are sure to be hooked. Each pack you buy comes with a pair of the LIBA Scalp Massager Tool allowing you to share the experience with your family and loved ones. The LIBA Scalp Massager Tool provides a soothing treatment of the head at an affordable price. MARNUR is a 3 in one multipurpose massager. It comes with a scalp massage pad, a full body massage pad and a shower loofah pad. It is battery operated electric scalp massager that has a vibrating hair brush head suitable for use on all the hair types from wet to dry, thin to thick as well as curly hair. You can as well use it to massage your scalp in the shower and improve on the circulation of blood as well as ease the itchiness of the scalp. The MARNUR Scalp Massager may as well work as a comb for the hair of animals. The massager has an ergonomic shape that allows it to comfortably fit on the hands with an extra grip for safety when using. It is portable allowing for easy use from anywhere be it in at home or in the office. To be safe, ensure that you remove the batteries if you intend on using the massager in the bathroom. It is water resistant. However, you should not submerge the MARNUR Scalp Massager in water. 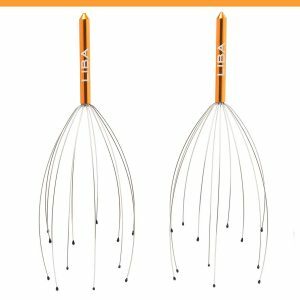 When choosing a head massager, you should be aware of the components and purpose to with the massager works to fulfill. Some head massagers are meant to help with controlling headaches, others work to support blood circulation, and others deal with promoting hair growth. A good scalp massager can deliver multiple results. 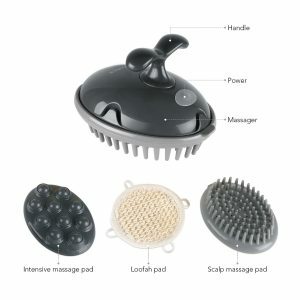 With all the options available in the market, the three listed scalp massagers above are inexpensive and viable options. They can deliver results without disappointments.